Last week you saw Part 1, Spring & Summer, vignettes on the pine chest that sits between my living room and kitchen. 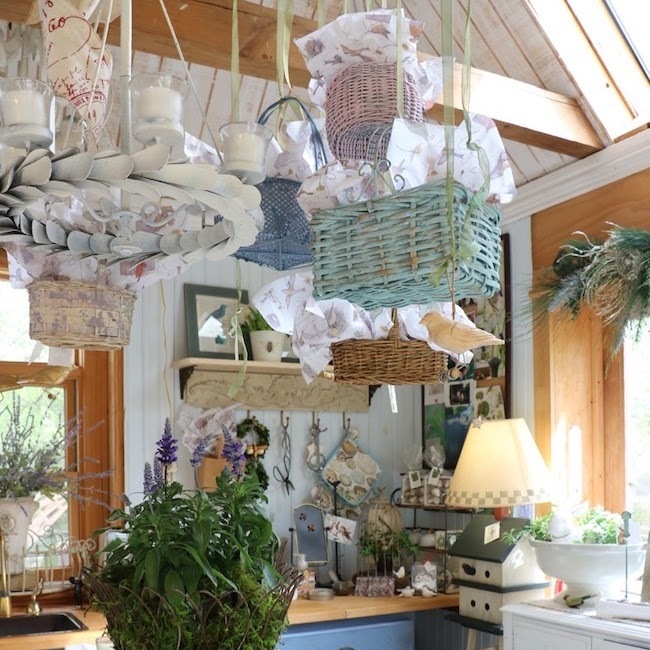 All with tips for how, where, and why to place items in arrangements. Here is Part 2, a collection of fall and winter vignettes. 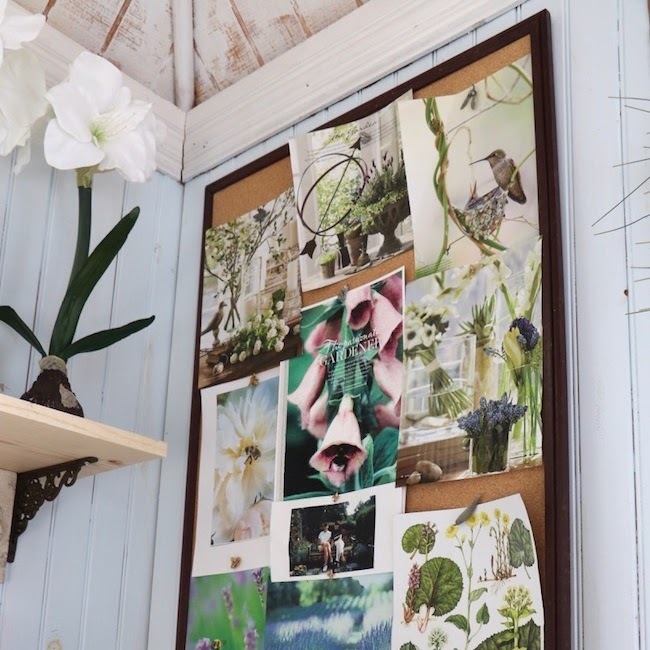 The collection is filled with easy to find, easy to do, and inexpensive items, and every arrangement has tips about how to create similar ones in your home. Please PIN ⥣ to your Fall Pinterest boards. Fall is showing up in the new magazines and blog posts, including here at Botanic Bleu. 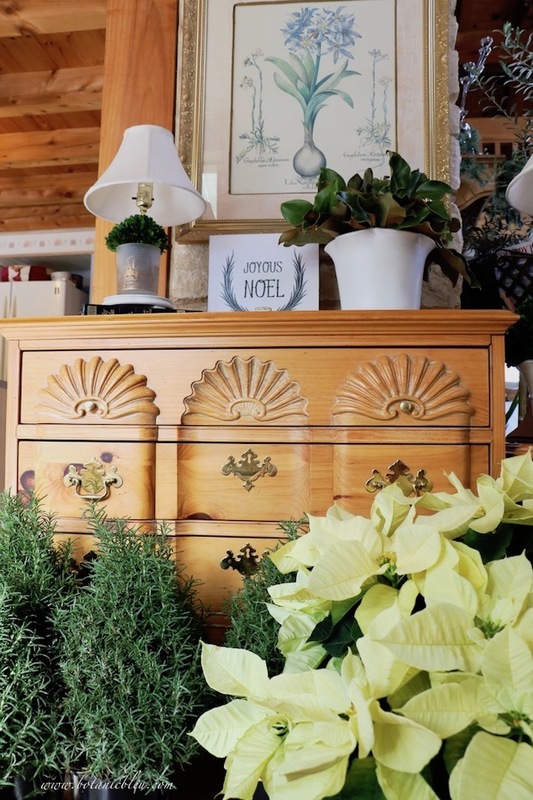 No, Botanic Bleu is not showing new decorations for this year yet, but is showing a look back at how my pine chest was decorated for fall and winter in the past. It is way too hot to bring out pumpkins now. Even though you may not be decorating for fall yet, you may be ready to begin planning your fall home decor. 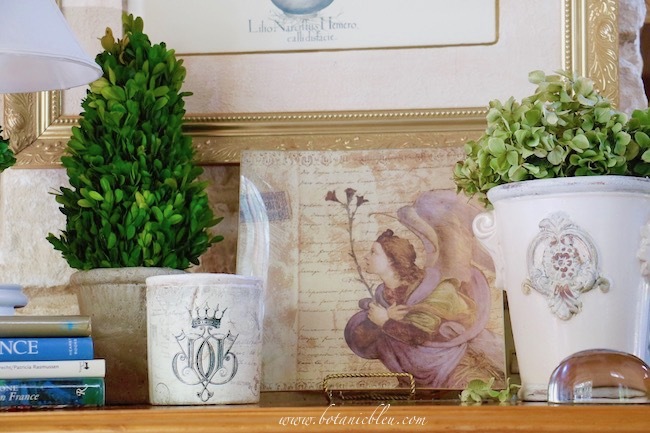 What better way to get ideas than to see a collection of vignettes with fall and winter ideas? The little chest of drawers is my go-to spot to decorate all during the year, for every season. 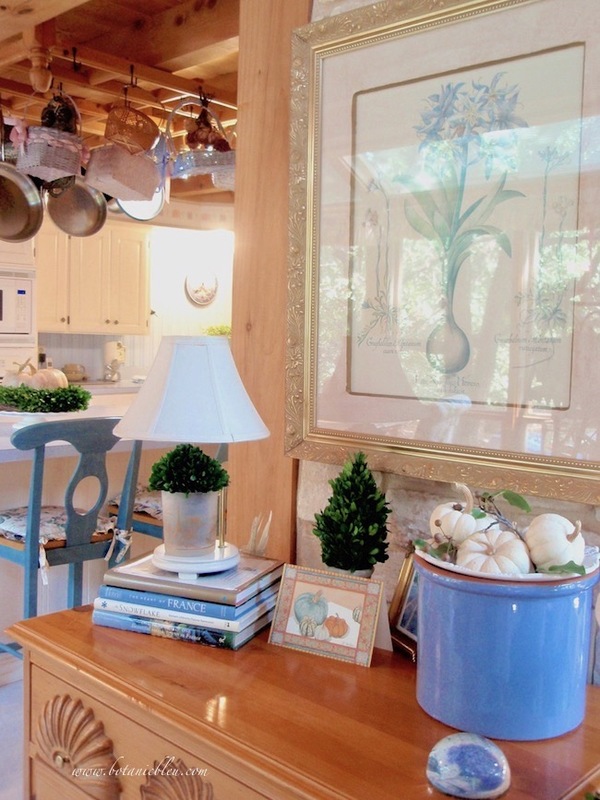 It is a spot to freshen up my house and to lift my spirits with pretty and fun ever-changing arrangements. An easy fall arrangement uses baby Boo Boo white pumpkins. You can find these everywhere, including grocery stores, and can get several for just a few dollars. Put them all over the house. Plus, they are perfect for those of us who love blue and white decorations. Three tips for how to do this arrangement . . .
① Use a shallow serving bowl to sit in the top of a large pot. 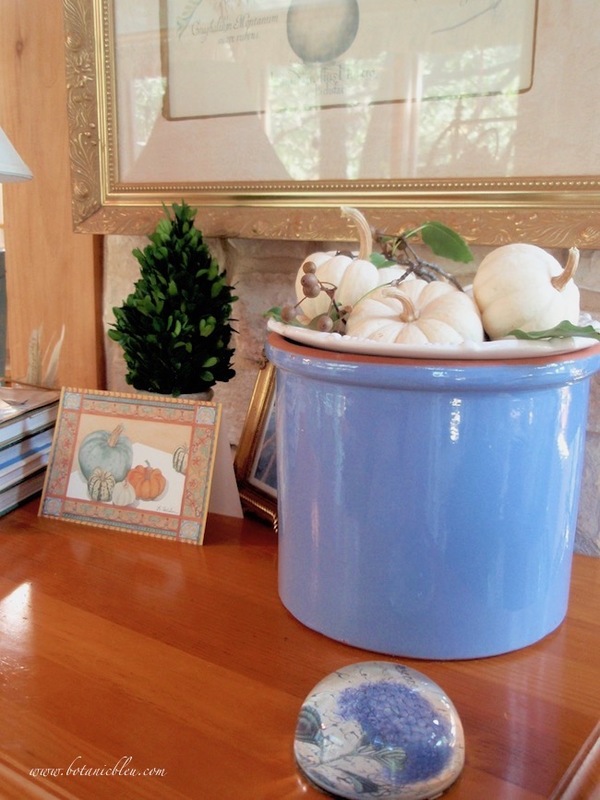 You do not have to fill the entire large blue flower pot with pumpkins. There are only four pumpkins in the bowl/pot. Another way to use just a few pumpkins is to fill the bottom of the pot with scrunched up newspaper with pretty scrunched up paper or shredded paper as the top layer. ② Use greenery from your yard. See those green leaves with clusters of brownish berries? Those are twigs from a non-fruiting Bradford pear tree growing in the back yard. ③ Use a fall card with pumpkins on it. Using cards is one of my all-time best decorating tips. You can get beautiful cards for little money. They add texture and color. AND, they are easy to store to use again. Think beyond the usual things that show up in fall vignettes. Why did I choose these things for a fall grouping? ① The green hydrangea is naturally air-dried and is a flower from an early fall garden. ② The small candle's script is charcoal and dark tones evoke shorter days and earlier nightfall. ③ The angel plate has somber brown tones with muted purple and yellow colors. ④ Three items are French inspired, and I try to find ways to use French style to reinforce a French Country look in my home. The tall flower pot has a raised French-style pattern. The candle has a French crown and script. The angel is reminiscent of medieval French art. Think about the overall look you want for your home. Choose items that create your personal style. Sometimes arrangements start out one way and end up differently. That is part of the fun of decorating. Arranging. Stepping back to look at it. Moving the items around. Adding a new item. Taking away an item. ① Since the angel is looking to the left, the best position for the plate is somewhere on the right of the vignette. Recall eye movement should be directed to keep the eyes looking back into the grouping, not left looking toward the outside of the grouping. ② Another principle of art design is to create a focal point in a scene. The eyes are drawn to the plate because it has color, is the largest overall item, and is the most detailed design in the group which invites studying it. 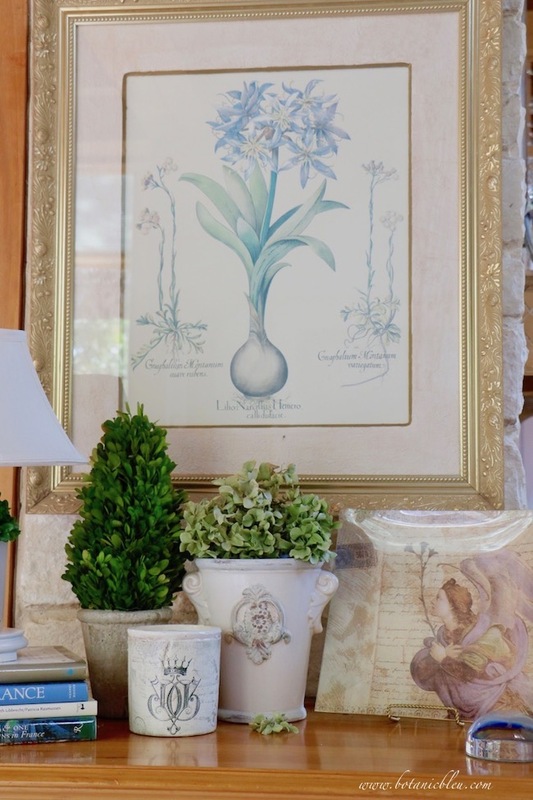 The angel plate in the middle of the grouping is the focal point for this vignette with the greenery on either side. ③ By placing the plate in the middle, the two side plants lead the eyes up to the print on the wall and back down from the print on the wall. If the plate were placed on the far right, the eyes would be left looking downward since the plate is shorter than the plants. Christmas is my favorite time to decorate. And sometimes I break all my own decorating guidelines. Crowded, no focal point, eye movement all over the place, but with a few redeeming features. 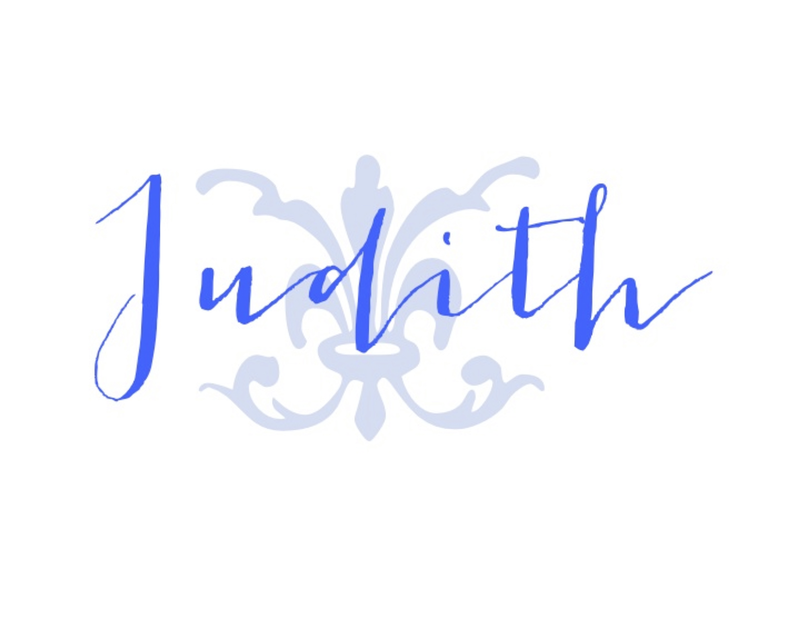 ① Coordinated muted color palette of soft greens, golds, and a pale blue is a refreshing scheme that goes with my blue and white everyday house. Red and green is just one color combination for Christmas. By using colors that go with your home's everyday look, you can create a Christmas look with just a few items instead of totally redoing your entire room. ② Gold is a unifying color. 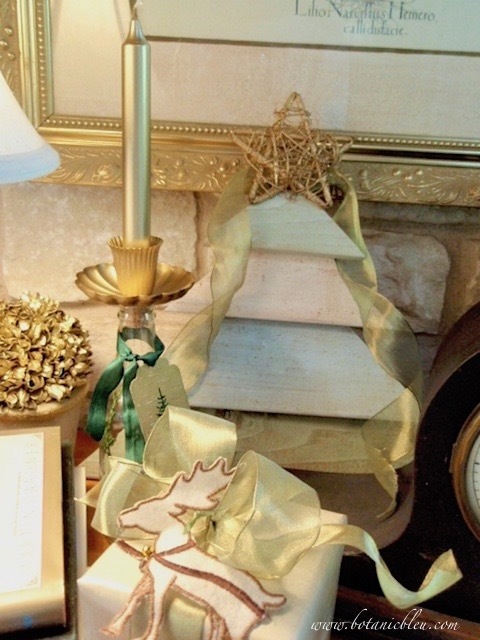 Print frame, candle, tree star, boxwood ball sprayed gold, book cover jacket outline, card dangling from candle, candle holder, and the gold shimmer in the pale green ribbon and wrapping paper. Sometimes the simplest arrangement is the most pleasing. 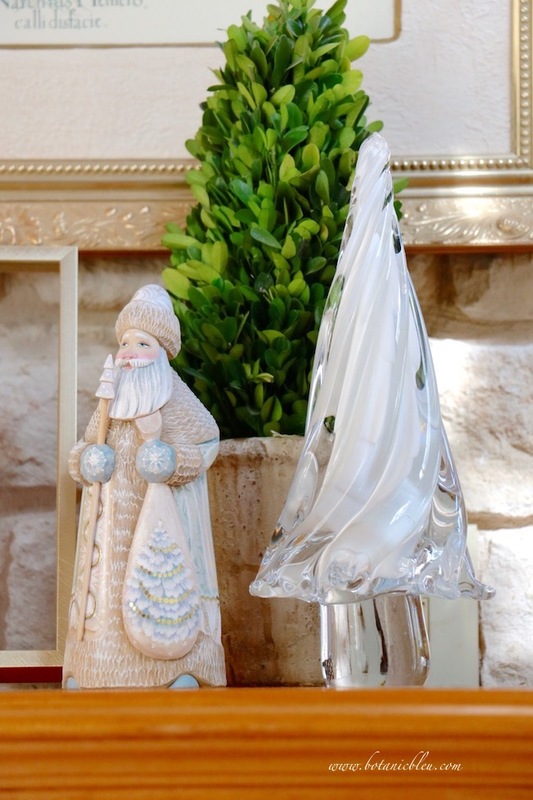 ① A hand-carved wooden Father Frost and a white swirled glass Christmas tree add contrasting textures which give interest to their neutral muted colors. A hand-carved Santa, signed on the bottom by the artist, is pricey, but is destined to become a family heirloom when you find one. ② Just barely in view is a gold edged clear glass frame for a special Christmas card. The clear glass keeps the vignette uncluttered looking. 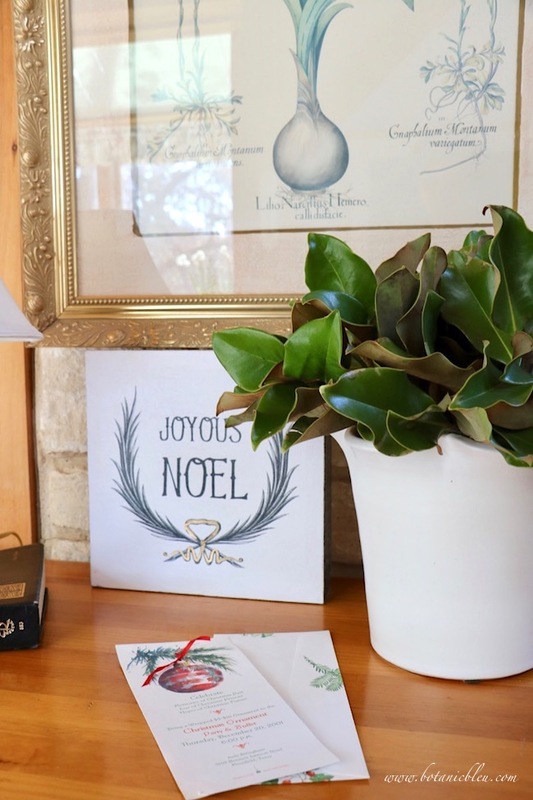 Another simple neutral palette for Christmas includes a stretched canvas quote, white ruffled edge flower pot with shiny fresh magnolia leaves, and an invitation to a Christmas party. ①Use floral leaf spray to give your holiday greens a polished, professional look. The spray keeps the greens looking fresh for several days. Look at your local craft store to find floral leaf spray. ② The French phrase is joyeux noël (Merry Christmas,) but an Anglicized version using joyous is still pretty merry! ③ Save pretty envelopes as well as pretty cards for fast, memorable decorating. Fresh plants add color and fragrance during the holidays. Large plants make beautiful arrangements on the floor, not just on top of tables, buffets, coffee tables . . .
① One large poinsettia makes a bigger impact than two to three smaller ones for about the same amount of money. ② Set fresh plants on plates to catch dripping water and to prevent water damage to furniture and floors. These plants are sitting on the stone hearth that wraps around the stone fireplace. 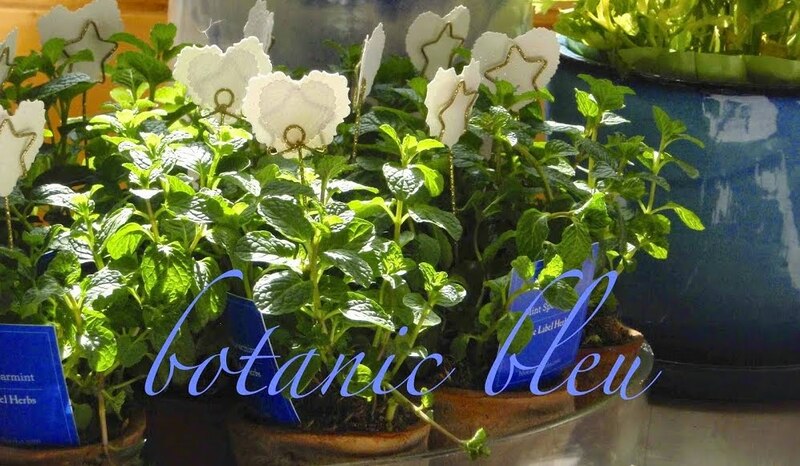 ③ Buy plants as soon as they are in the garden centers. You get better selections and can take care of them at home. If the weather is not freezing, fresh rosemary topiaries do better outside until you are ready to use them. Live poinsettias are extremely cold sensitive and are damaged easily by exposure to cold temperatures. Keep them inside out of drafts from furnaces and opening/closing exterior doors. ④ Give fresh plants, like rosemary topiaries and poinsettias, as presents to friends and co-workers. Buy early. Use them to decorate your own home until you give them as presents. Give as gifts two to three weeks before Christmas so your friends can enjoy them all during the holidays. Good quality faux plants are worth the investment. One large arrangement is stunning and can be used for several years. Black and white is a classic combination that works well at Christmas for a neutral look. 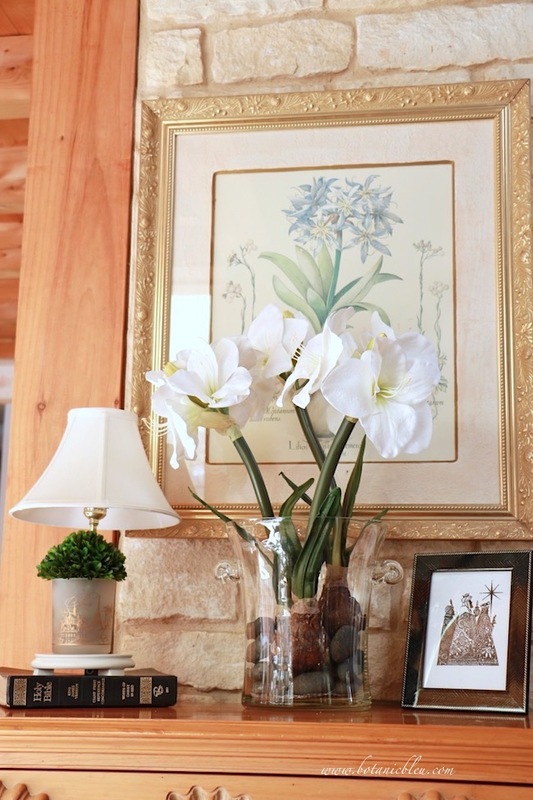 Can you see the amaryllis arrangement sitting on a large marble topped kitchen island? ① Use an odd number of flowers. This arrangement has three stems with multiple flower heads on each stem. These particular amaryllis stems are weighted with flat bottoms so they can stand alone without the need of a flower pot. ② Create an arrangement that can be disassembled for more flexibility. Place the flowers in a large clear ice bucket or flower vase. Anchor the flowers in black river rocks, but do not make the arrangement permanent by using glue or artificial polyurethane water. 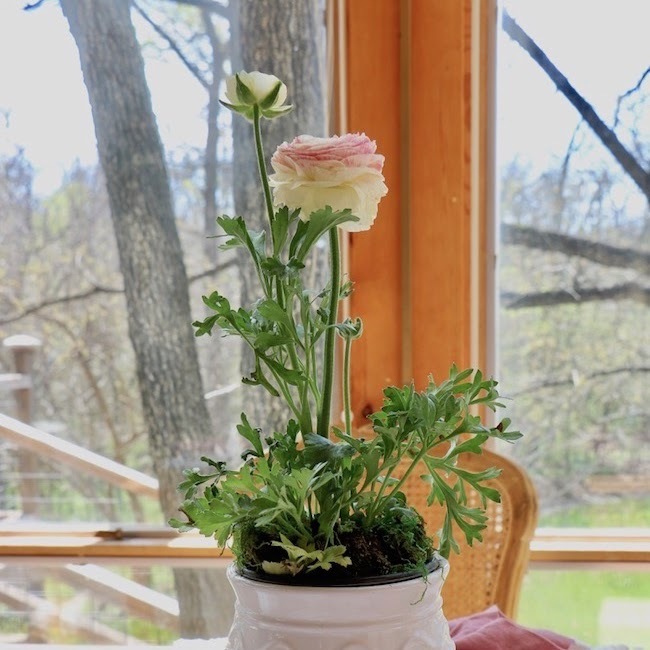 You can take the arrangement apart to use both the flowers and container in other ways. ③ Repeat the color black with a framed black and white three wisemen print. This vignette would be better arranged by switching the framed print and lamp. Then the wisemen would be facing into the vignette, not facing toward the outside of the vignette. ④ Repeat the color black with a book underneath the lamp. Use the same color at least three times in a vignette. ⑤ I used the Bible my mother studied from everyday and took to church with her. 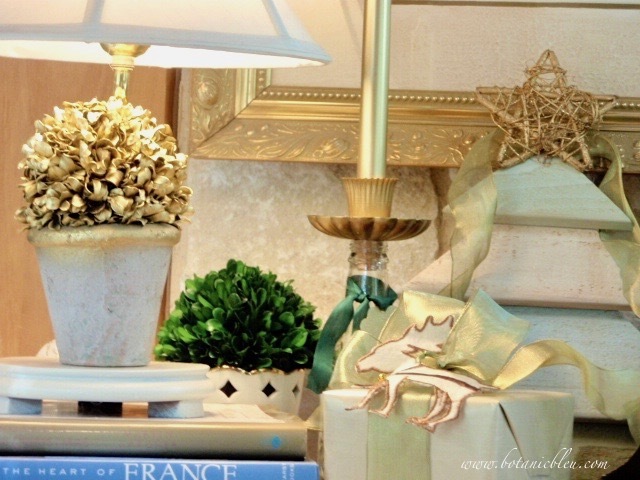 Use special personal objects in your vignettes to give them more meaning to you. The Bible paired with the three wisemen print remind me of the religious significance of Christmas every time I look at them. One of the greatest legacies from both my parents was their strong faith and their teaching all of us the importance of living a life that makes a difference to others. 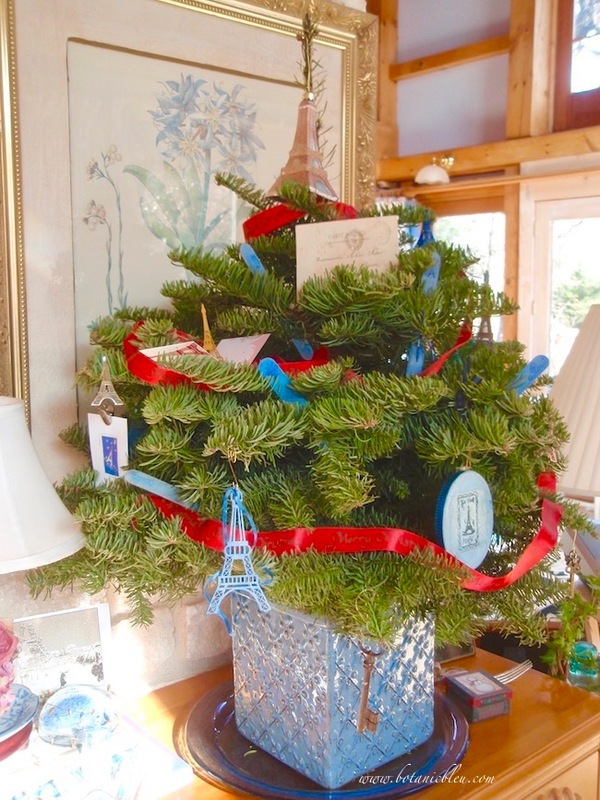 An Eiffel Tower laden Christmas tree fills the top of the pine chest. Blue decorations and a blue flower pot fit the colors in my house. ① Make a tabletop fresh live tree by cutting the top out of a four or five foot tree. Use the bottom of the tree as fresh greenery throughout your house . . . on the mantel, as a wreath, over pictures, as a garland down the dining table. You can buy a four or five foot tree for about the same price as a tabletop tree, but get much more greenery for your money. 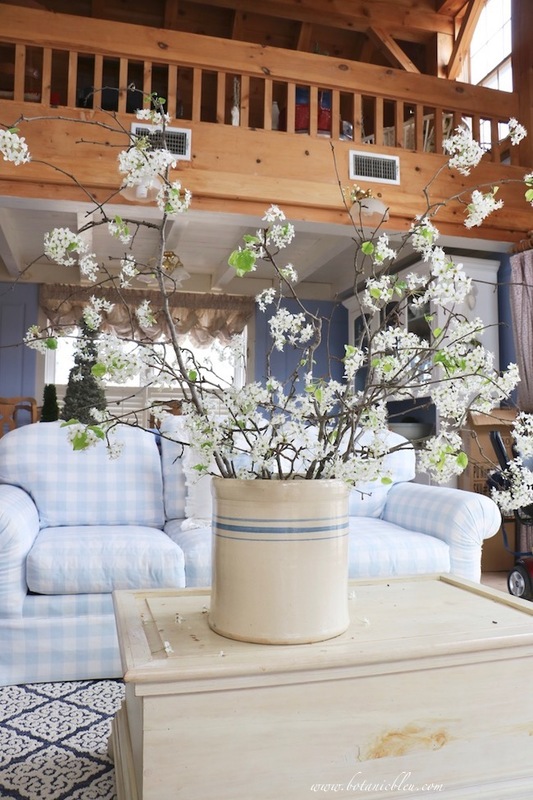 ② Use a ceramic flower pot as a tree holder for tabletop trees. The weight of the pot makes the tree stable. I wedged a couple of bricks on the sides of the trunk inside the pot for even more weight and to keep the tree upright. ③ A large platter or plate charger makes a good saucer on which to place the tree. Be sure to use a waterproof saucer such as glass to prevent damage to your furniture. ④ Decorate your tabletop tree with more than Christmas ornaments. A vintage French postcard, souvenir pop-up Eiffel Tower cards, and hand-stamped blue wood craft sticks fit both the color and Eiffel Tower theme for this little chubby tree. I hope you found a few ideas you can use to help you create your upcoming fall and winter vignettes. 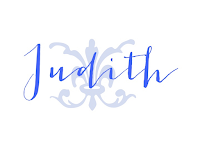 By thinking about them now, you have plenty of time to order something fun, or craft something new, or go on an antique-buying trip like to Round Top, TX to find special brocante (second-hand goods) for your home. Collecting the objects is half, or more, the fun in decorating. 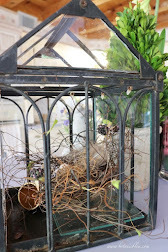 If you missed Part 1, Spring and Summer vignettes, you can find additional tips for creating vignettes there. The following items are available through my Botanic Bleu shop. Beautiful and inspiring, as always. You share the best information too. As someone who does not love the traditional fall colors of orange and brown your autumnal grouping truly delights my soul. Some cooler weather would be lovely right now. Thanks for the inspiration while we wait. 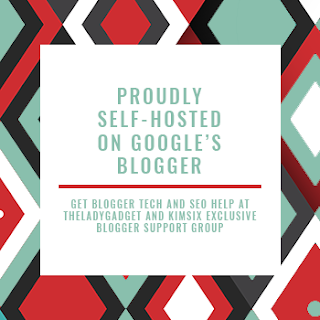 Thanks for linking to Keep in Touch.